I’ve been cooking up lots of comfort food lately. Food that makes you feel safe, secure and remind you of better days. For me comfort foods include soups, stroganoff, brownies and cheesecake. Thankfully, I have found a vegan alternative to ALL of my favorite comfort foods. My mom was the inspiration for the Vegan Stroganoff recipe below. Try this! Quick, easy and delicious! Heat first six ingredients on low until sauce thickens then add sour cream and noodles. Add salt and pepper to taste. As a recent transplant to Des Moines, a new adventure in searching for places to eat and things to enjoy has begun! 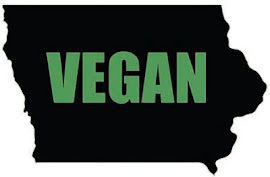 My stomach misses Iowa City – home of all things good and vegan in Iowa. However, Des Moines has quite a few “Vegan Friendly” restaurants that I have come to enjoy. Cool Basil - 8801 University Ave, Clive Iowa (50325); Great selection of Thai food and good vegetarian sushi! A-Dong Restaurant – 1511 High Street, Des Moines, IA 50309-3109; Really fresh Vietnamese food, with a separate vegetarian menu! Bandit Burrito – 5340 Merle Hay Road, Johnston, IA 50322; Bandit has a “Soy-Chorizo” you can add to your veggie burrito and fabulous guacamole. PF Changs – 110 South Jordan Creek Parkway, West Des Moines, IA 50266-8141; Located next to Jordon Creek Mall, Changs has a small vegetarian menu, as well as a Gluten Free menu! Ritual Café - 1301 Locust St Ste D, Des Moines Iowa (50309) (at Grand); Small menu with some great veggie selections! Groceries – There are a few markets in town outside of Hy-Vee’s small health food section. These are the places I found that actually have good organic produce. I still travel up to Ames or back to Iowa City to hit the Co-ops and stock up on my bulk food items!